Androgenetic alopecia (AGA) is an androgen-dependent alopecia resulting from the conversion of scalp terminal hair into miniaturized vellus hair in a characteristic pattern manifested as progressive, patterned hair loss that occurs in genetically predisposed individuals. The frequency and severity of AGA increase with age and at least 80% of Caucasian men and 50% of women show evidence of AGA by the age of 70 years. The age of onset of AGA in women is later than that seen in men., Pigmented terminal hairs are progressively replaced by finer hair, which are short and virtually nonpigmented. The pattern of hair loss and the clinical presentation of AGA in women differ from that in men. Women may present with either an episodic or continuous increase in hair shedding without any noticeable reduction in hair volume, increased hair shedding with loss of hair volume over the crown, or diffuse thinning over the crown with no history of hair shedding. Ludwig described hair changes in female AGA (FAGA) in three grades according to the severity of hair loss (Grade I, II, and III). 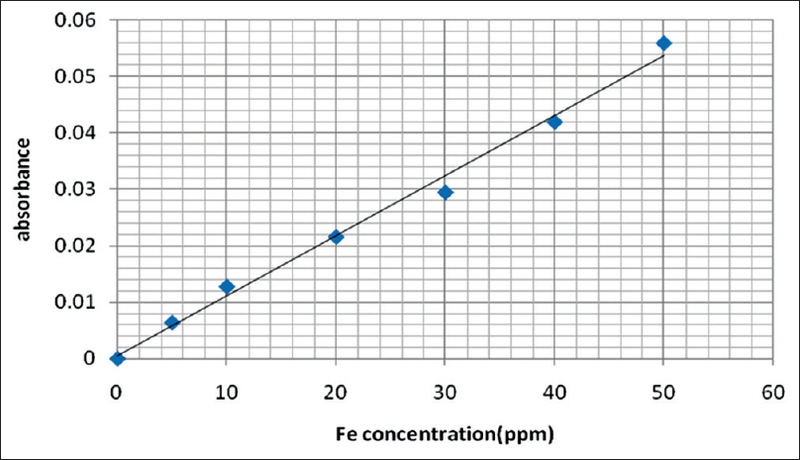 Iron is the most abundant trace element in humans. It mediates chemical reactions that are critical for life, forming part of the enzymes implicated in DNA synthesis and cell respiration. An earlier study demonstrated that the mean ferritin level in patients with AGA was significantly lower than that in normal individuals without hair loss. In the current study, female patients with AGA were selected because we assumed that factors other than androgens, like trace elements, might be involved in the etiopathogenesis of FAGA. Suggestive evidence for this hypothesis was that the number of androgen-sensitive receptors at the female frontal area were approximately 40% lower than that in male and 5α-reductase I and II enzymes activities in this area had a 2 and 3.5 times less activity than those in man. Even more, the aromatase enzyme activity at the frontal area in women was 6 times more active than that in men. 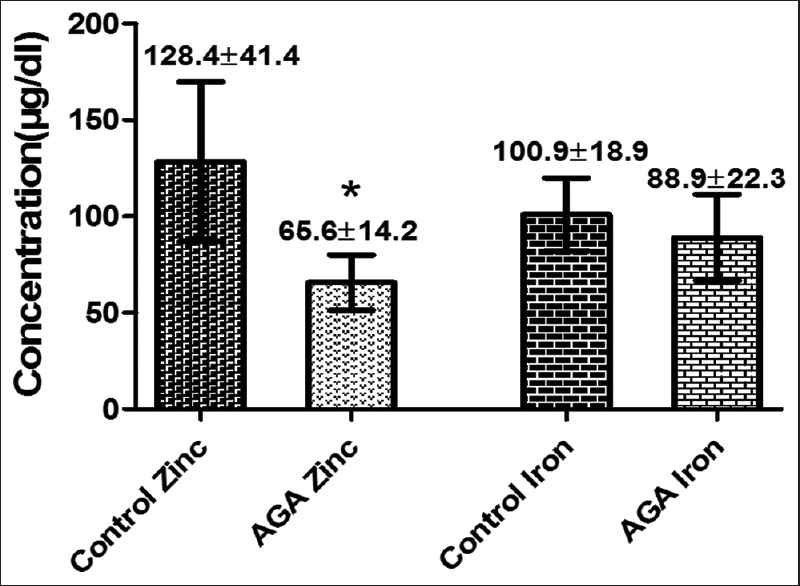 The purpose of this study was to assess the serum and hair levels of zinc and iron in women with FAGA and to compare it with those in normal individuals and to demonstrate if there was any correlation between these elements and the grades of FAGA. Fifty-five women aged 20–45 years were selected in this study. It was conducted from May 2014 to November 2015 at Department of Dermatology, Basra Teaching Hospital, Basra, Iraq. The participants were divided into two groups: The first consisted of 27 women with clinical diagnosis of FAGA, while the second control group was 28 healthy women. The purpose of the study was explained to the participants, and all of them signed an informed consent. The study was approved by the Institutional Ethics Committee. Exclusion criteria included: Women with FAGA who had other clinical feature of androgen excess such as hirsutism, acne, menstrual cycle disturbances or polycystic ovary syndrome, galactorrhea or virilization; patients who on hormonal therapy; women with any of the confounding factors capable of affecting serum micronutrient levels (pregnancy, lactation, malabsorption syndrome, malnutrition) as well as exposure to medication with the potential of causing alopecia or trace element supplement; and women who had undergone significant physiologic stresses such as surgery or fever before the onset of alopecia and those who had history of chronic diseases such as thyroid, liver, or kidney ailments. The diagnosis of FAGA was based on the following considerations: Slow progression of hair loss at the frontovertical site, visual confirmation of the presence of thin and short hairs in the vertex, and negative hair pull test. To classify the degree of FAGA, the Ludwig classification system was used. The control group was healthy volunteers and they were selected from patient's accompaniment, relatives, or attendee friends without FAGA, they matched for the same age and subjected to the same exclusion criteria. All the participants provided details of their ages, duration of alopecia, medical history, family history of FAGA, and drug intake history. For determination of iron and zinc levels in serum samples, fasting venous blood was drawn into tubes without anticoagulant, centrifuged, and the resulted serum was kept frozen until trace elements analysis. One ml of serum was diluted to 10 ml final size with distilled water for trace element analysis. Hair samples were cut near the scalp area with thin-blade stainless steel scissors from the frontovertical area, 5–10 cm away from frontal hairline, subsequently samples were accurately weighed to 1.000±0.300 g. Hair samples were washed with trace element-free detergent, and then, the samples were rinsed with distilled water more than once, dried at ambient temperature, and prepared for the wet digestion procedure. The zinc and iron in hair samples must be released, firstly from the protein matrix by wet digestion method and then determined by atomic absorption spectrophotometer (AAS) using a Buck Model 211-VGP spectrophotometer according to operator's manual with a detection limit of 0.005 ppm for zinc and 0.05 ppm for iron. Values were expressed as mean ± standard deviation, significance level of difference was determined using the Student's t-test. Intergroup comparison analyzed by one-way analysis of variance (ANOVA). P<0.05 was considered statistically significant. Analysis was carried out using GraphPad Prism software for Windows (version 5.0, GraphPad Software, Inc., SanDiego, CA, USA). The mean of serum zinc concentration level in the women with FAGA was significantly lower than that observed in the control group (65.6±14.2 μg/dl, 128.4±41.4 μg/dl, respectively) (P<0.05), while serum iron concentration, although it was lower in patient group than in control (88.9 ± 22.3 μg/dl vs. 100.9 ± 18.9 μg/dl), but it was not significantly different [Figure 3]. Hair zinc concentration in FAGA group was significantly lower than that observed in control group (103.4±25.5 ppm and 143.5±33.1 ppm respectively), similarly, hair iron concentration in FAGA group (17.9±3.8 ppm) was significantly lower than in control group (26.9±7.4 ppm) [Figure 4]. To determine whether zinc and iron levels in both hair and serum were correlated with severity of FAGA, patients were classified into three subgroups (I, II, and III) according to Ludwig's classification. The results showed that Grade I was reported in 10 patients (37.03%), Grade II in 13 (48.15%), and Grade III in 4 patients (14.81%). 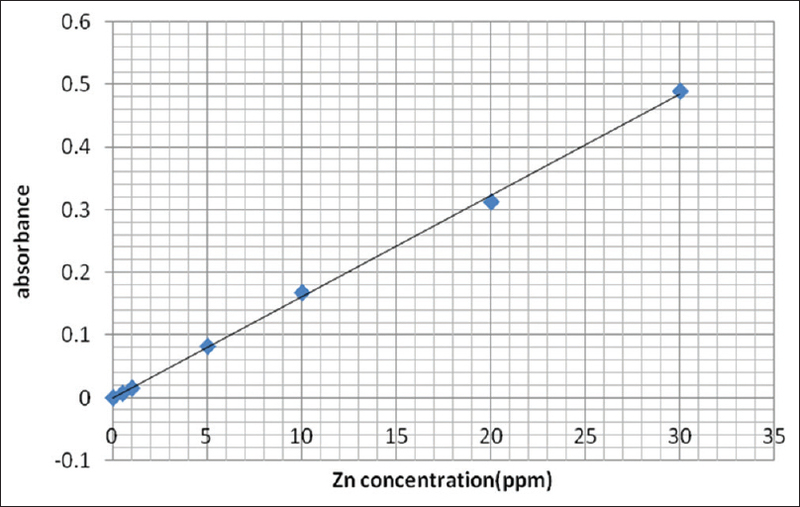 Except for hair iron, no significant difference in the level of zinc and iron was found among the different groups [Table 1] and no significant correlation between serum zinc and iron and hair zinc and iron levels within each group was determined [Figure 5] and [Figure 6]. Hematological analysis using blood sample has been commonly used in the determination of trace element status in the body; while serum tends to show current or short-term body status, hair represents a depot for these elements, potentially for years, elements also accumulate in hair at a higher concentration, allowing for more sensitive and more analytically accurate results.,, Therefore, determination of trace elements in human hair can indicate more precisely the levels of these elements in the body. In the present study, we found low hair and serum zinc levels in women with AGA in comparison to healthy controls (P<0.05). There is an abundance of published studies focusing on the level of hair and serum zinc in alopecia, but very few studies address FAGA. Skalnaya et al. showed a regional variation in scalp hair zinc level with lower zinc content in the hair of frontal area in comparison to the occipital area in women with AGA. Other study by Kil et al. on healthy controls and patients with different types of alopecia including AGA, they noticed that serum zinc concentration in all patients was significantly lower than the control group. Nevertheless, they did not attempt to measure the zinc concentration in the hair itself. Jin et al. reported that the hair zinc level in male AGA (MAGA) patients was significantly lower than in hair of healthy men. On the other hand, Ozturk et al. investigated hair, serum, and urine zinc concentration in MAGA patients and the result was compared with control group; they found that only hair zinc level in MAGA patients was significantly lower than that in control, while serum and urine zinc levels did not exhibit changes. 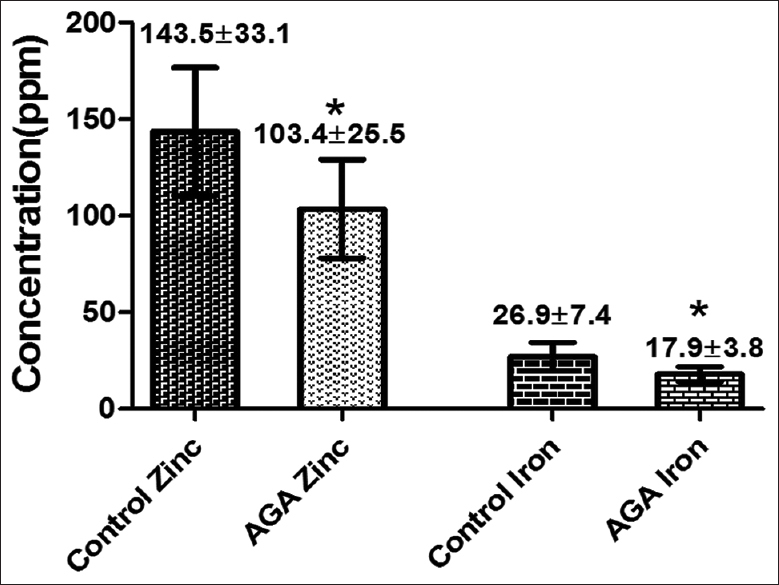 Although it was not significant, some other studies demonstrated lower serum zinc level in patient with AGA in comparison to normal individuals., At animal experimental models, zinc has an ambivalent but potent modulator of murine hair growth and in chemotherapy induced alopecia, zinc significantly accelerates the re-growth of normally pigmented hair shafts and promotion of hair follicles recovery. Zinc has been shown to have an antiandrogenic potential and it specifically inhibits 5α-reductase type 1 and 2 activity, thus promoting hair growth.,, It also has considerable effect on hair growth in androgenic alopecia in a randomized, clinical study. It is difficult to explain the likelihood of low serum zinc levels in FAGA in the studied sample in comparison to healthy control, however, low dietary zinc intake or imbalance diet in genetically susceptible individuals are suggested. Previous studies were focused on measurement of serum ferritin as an indicator of body iron store and its relation to different types of nonscarring alopecia including FAGA but did not evaluate hair iron concentration. Rasheed et al. evaluated serum ferritin in females with telogen effluvium and FAGA and showed that serum ferritin levels were significantly lower than that in controls. They proposed a threshold hypothesis, in which decreased iron stores would lower the threshold for developing different types of alopecia. On the other hand, a case–control study found no difference in the prevalence of depleted iron stores or the prevalence of iron deficiency anemia in FAGA patients compared with controls. We thought that hair iron level was as valuable as serum ferritin as a parameter of long-term iron body content. In the present study, except for hair iron we did not find significant difference neither in serum iron nor in serum and hair zinc levels in relation to grades of FAGA, although we expected that zinc and iron levels might correlate with the severity of alopecia. This might be attributed to the small sample size in each group. Even more, there was no significant correlation between the levels of zinc and iron in both serum and hair; this might be because of serum trace elements were subjected to fluctuation, not like hair which reflected a depot status. Serum and hair levels of zinc and iron were lower in FAGA patients than normal individuals and except for hair iron; levels were not correlated with the severity of alopecia. Sinclair RD. Common baldness and androgenetic alopecia. In: Burns T, Breathnach S, Cox N, Griffiths CH, editors. Rook a textbook of Dermatology. 8th ed. Singapore: Welly-Blackwell Publishing Limited; 2010. p. 6616-31. Gan DC, Sinclair RD. Prevalence of male and female pattern hair loss in Maryborough. J Investig Dermatol Symp Proc 2005;10:184-9. Norwood OT. Incidence of female androgenetic alopecia (female pattern alopecia). Dermatol Surg 2001;27:53–4. Salman KE, Altunay IK, Kucukunal NA, Cerman AA. Frequency, severity and related factors of androgenetic alopecia in dermatology outpatient clinic: Hospital-based cross-sectional study in Turkey. An Bras Dermatol 2017;92:35-40. Fayed AH, Gad SB. Effect of sildenafil citrate (Viagra®) on trace element concentration in serum and brain of rats. J Trace Elem Med Biol 2011;25:236-8. Levy LL, Emer JJ. Female pattern alopecia: Current perspectives. Int J Womens Health 2013;5:541-56. Gupta M, Mysore V. Classifications of patterned hair loss: A review. J Cutan Aesthet Surg 2016;9:3-12. Maywald M, Wessels I, Rink L. Zinc signals and immunity. Int J Mol Sci 2017;18. pii: E2222. Plonka PM, Handjiski B, Popik M, Michalczyk D, Paus R. Zinc as an ambivalent but potent modulator of murine hair growth in vivo – Preliminary observations. Exp Dermatol 2005;14:844-53. Kil MS, Kim CW, Kim SS. Analysis of serum zinc and copper concentrations in hair loss. Ann Dermatol 2013;25:405-9. Park SY, Na SY, Kim JH, Cho S, Lee JH. Iron plays a certain role in patterned hair loss. J Korean Med Sci 2013;28:934-8. Pasha Q, Malik SA, Shaheen N, Shah MH. Comparison of trace elements in the scalp hair of malignant and benign breast lesions versus healthy women. Biol Trace Elem Res 2010;134:160-73. Yorulmaz H, Seker FB, Demir G, Yalçın IE, Oztaş B. The effects of zinc treatment on the blood-brain barrier permeability and brain element levels during convulsions. Biol Trace Elem Res 2013;151:256-62. Price VH. Androgenetic alopecia in women. J Investig Dermatol Symp Proc 2003;8:24-7. Colagar AH, Marzony ET, Chaichi MJ. Zinc levels in seminal plasma are associated with sperm quality in fertile and infertile men. Nutr Res 2009;29:82-8. Ishak I, Rosli FD, Mohamed J, Mohd Ismail MF. Comparison of digestion methods for the determination of trace elements and heavy metals in human hair and nails. Malays J Med Sci 2015;22:11-20. Ozturk P, Kurutas E, Ataseven A, Dokur N, Gumusalan Y, Gorur A, et al. BMI and levels of zinc, copper in hair, serum and urine of Turkish male patients with androgenetic alopecia. J Trace Elem Med Biol 2014;28:266-70. Wang CT, Liu LY, Chou SS, Lee BT. Correlation of calcium, copper, iron, magnesium and zinc content in hair with basal metabolic rate and bioelectrical impedance in adolescent females. Tzu Chi Med J 2008;20:58-62. Skalnaya MG, Tkachev VP. Trace elements content and hormonal profiles in women with androgenetic alopecia. J Trace Elem Med Biol 2011;25 Suppl 1:S50-3. Abdel Fattah NS, Atef MM, Al-Qaradaghi SM. Evaluation of serum zinc level in patients with newly diagnosed and resistant alopecia areata. Int J Dermatol 2016;55:24-9. Dutra RL, Cantos GA, Carasek E. Analysis of zinc in biological samples by flame atomic absorption spectrometry: Use of addition calibration technique. Biol Trace Elem Res 2006;111:265-79. Brüske K, Salfeld K. Zinc and its status in some dermatologic diseases – A statistical assessment. Z Hautkr 1987;62 Suppl 1:125-31. Azzouni F, Godoy A, Li Y, Mohler J. The 5 alpha-reductase isozyme family: A review of basic biology and their role in human diseases. Adv Urol 2012;2012:530121. Brocard A, Knol AC, Khammari A, Dréno B. Hidradenitis suppurativa and zinc: A new therapeutic approach. A pilot study. Dermatology 2007;214:325-7. Sahin C, Pala C, Kaynar L, Torun YA, Cetin A, Kurnaz F, et al. Measurement of hair iron concentration as a marker of body iron content. Biomed Rep 2015;3:383-7.